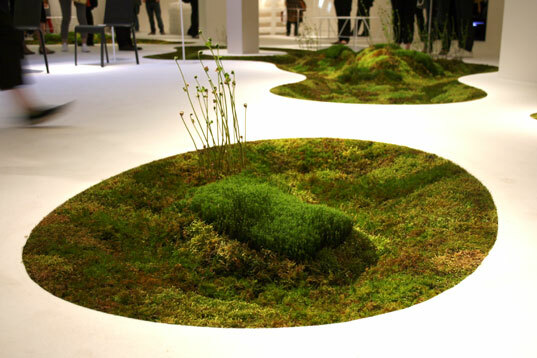 Among all the great green designs discovered at the 2009 Milan Furniture Fair, this beautiful biodegradable moss planter at the Tokyo Fiber Sensware exhibition definitely stood out. 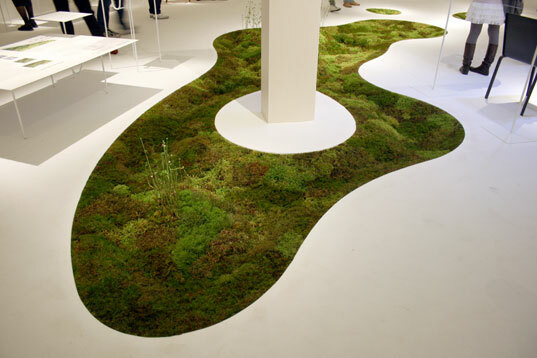 Japan-based flower artist Makoto Azuma collaborated with Unitika Ltd. to create an indoor glade, populating the planter with an assortment of mosses. 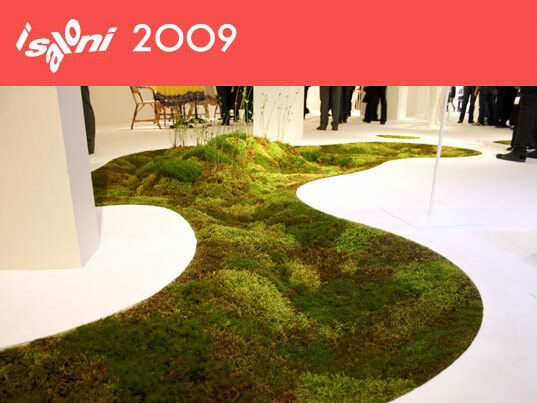 The result is an exquisite organic carpet that runs through the exhibition, passing round the furniture and the poles and stunning visitors with its delightful presence. Terramac® is an eco-friendly 3D knitted and spun fabric which serves as a receptacle for the planter’s roots, protects the seeds, and holds the moss together. Made from plant-derived polylactic acid fiber, “this material is decomposed (biodegraded) by microorganisms in compost or in soil after 10 years. Eventually only carbon dioxide and water remain”. As the planter biodegrades, CO2 is captured by the plants through the process of photosynthesis. The name Terramac® means “sons of the mother earth”. 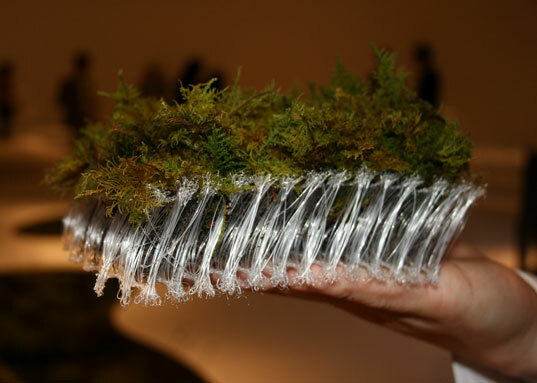 The real beauty of this technology lies in the pairing of a plant-derived plastic with a plant (here the moss) to create an improved sustainable environment. 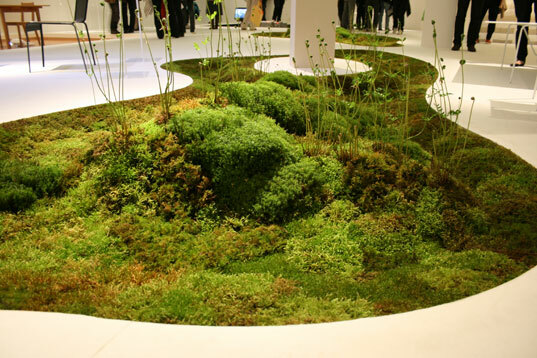 Generally found growing on the sloping sides of embankments, moss can now be integrated within the heart of our homes and cities. We love when industry meets design to offer practical solutions that embellish our lives in a more sustainable way! You don't need the specialized material, because Moss doesn't have roots! I was hoping this wouldnt require thebuse of specialised materials. Oh well. This is a beautiful product. So many negative comments though. Have any of you thought about how many plants are in a household at a time? I can tell you right now there\\\'s atleast 30 in mine.To take plants out of the house is to slowly neglect our relationship with the earth. No one stops to enjoy life anymore. I would love to bring this into my house. It would make a great shower rug and I\\\'m sure could easily live off the humidity that a bathroom tends to render. Plus it would give me a chance to appreciate nature one footstep at a time. Plus for y\\\'all with mildew mold allergies this is MOSS. Show the artist who created this a lil appreciation would ya. I think it is amazing! It is a beautiful and clever idea! How can I get my hands on some!?!???? This product is simply collecting moss AWAY from its natural habitat, which is not environmental -not even environmentally friendly-. Besides, that moss will not grow or propagate, in fact it will just die (the ones pictured probably died right after the show). It is very difficult to succesfully grow moss indoors: atmospheric conditions such as temperature, moisture, airation and drainage all interact to keep this plant alive. And each of the several thousand species of moss respond to different conditions. Main stream residential use... HAHAHAHAH! Interesting idea but I think ultimately pointless and with very few real applications as described. That being said the 'fabric looks like it would be great for stabilising sand dunes or to assist upland regeneration around pathways. Love it! However, why use a prefabricated product like Terramac when you can easily create a soil moss mix with a bark or coconut hull topping that the moss will love. Great post! I'm always looking for creative ways to bring the outside into our home. I just had a couple of questions...How long does it live? Do you know if it will be available for mainstream residential use? Thanks! Ecology for the rich. Like the palace garden in Dune. Perhaps you'd do more good focusing less on creating a trendy fashion statement and more on pressuring the leisure class to pursue effective change instead of placing hope on pad fads? More cloistered, manufactured reality for people to ignore the cynical industrial landscape forced upon the rest of society. They don't need fantasies. They need a rude wake up call. CO2 in your house is not an issue anyways - i dont see why it would matter that if ti releases it when it dies, such a negligible difference. Plankton in the oceans absorb far more CO2 than all the plants on earth combined. Would I call it eco-friendly not exactly, just eco-integration. Moss only release spores when raindrops hit them or animals step on them, but I'm not sure how long a moss plant lives, and since some mosses can grow on rock's without soil what is stopping it from growing out of control? Lastly I'd rather have the insects in my house be in there then in my room! Still very cool. I would like to try it. It is beautiful. Very creative and beautiful, but eco-friendly? Is the manufacturer (or article author) forgetting or ignoring the fact that plants do not capture CO2 forever. As soon as those plants die and start to decompose, that CO2 is released again. This is why carbon sequestration via forestation is not a via long-term solution to climate change. This product is hardly going to be a large-scale contributor to the problem, but its decomposition is hardly neutral. Perhaps the larger question is of the manufacturing process. How much of an impact on the environment though energy requirements, waste, emissions, etc. does it have? Don't get me wrong: I love plants and forests and incorporating them into our living spaces, but we need to be sure that when someone tells us something is "eco-friendly" it is, in fact, so. You are so right zokotel. It's sad that everybody has to be negative about everything! I , myself, loved it, It's a really cool idea and very nice to look at. What happens when the mosses release their spores? Indoor allergies anyone? It's so funny to see that the society we've been bred into has sent us completely insane. A fantastic idea has been added and it's there for us to enjoy. So what does the first comment say... "When someone falls ,who liable?" Come on the thing you should be commenting and thinking about is whether you like/dislike it or like me i thought that more oxygen in the house would be nice :) Have a wonderful day. Not for the mold/mildew sensitive folks. I think it will attract thousand of fly's and other little instects. Nice, in your living room! is meant for visual enjoyment & help to capture CO2...and obviously not for u to step on it, so no worris about the slip down. When someone falls ,who liable?